A photo posted on the hit talent show's Twitter page showed the rocker filming with Lady Marmalade singer Christina and read: "Welcome Billie Joe (@BJAofficial) to #TeamXtina! We are ready to rock out in Season 3!" In a statement, the Boulevard Of Broken Dreams rocker said The Voice wasn't about moulding an artist, "it's just giving them a little bit of guidance and direction without giving them a complete makeover". 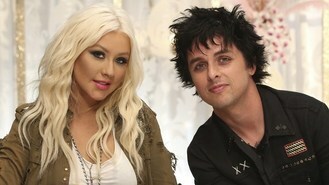 Billie Joe, who started filming on the show this week, also said working with Christina was "a lot of fun". The Voice returns to US TV in September. Joining Christina on the coaching panel are Cee-Lo Green, Adam Levine and country singer Blake Shelton.